Owais Ahmed came in today fourth in chips and our field was whittled down very quickly in the early levels as we lost several players early on including notables Barry Greenstein, Thomas Keller and Richard Ashby. 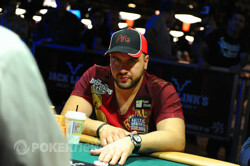 During this period of time Michael Mizrachi dominated the proceedings, at one point having over a million chips (almost a third of what was in play) while there was still ten players remaining. Ahmed stayed in contention around this point despite being one the shorter stacks and was barely more than a couple of bets from being eliminated as we approached the final table. Antony Lellouche was our official final table bubble as it appeared no-one could stop the 'Grinder' from steamrolling this final table. The key turning point for Ahmed was after he eliminated Scott Bohlman in fourth place, placing him almost equal in chips with Abe Mosseri, though still some way behind Mizrachi. Mosseri lost several crucial pots and went out in third and Ahmed started heads up with a 2:1 deficit but managed, in an incredibly swingy heads up encounter, to gradually grind out the 'Grinder', finally finishing his foe with around 30 minutes left of the final level of the night. Ahmed wins his first bracelet of his career as well as over a quarter of million dollars for his efforts, congratulations to him from everyone here at PokerNews and stay tuned for more WSOP action tomorrow from 12pm! 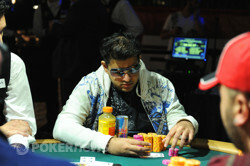 Michael Mizrachi raised preflop and Owais Ahmed made the call to see a flop of . Ahmed then check-raised Mizrachi's bet and was called. On the turn, Mizrachi check-called all in as all the spectators almost rushed the stage trying to see what was happening. Mizrachi showed for aces up against Ahmed's for a gutshot and flush draw. Mizrachi could double up as long as he avoided a deuce, heart or king while Ahmed would chop with any six to eight to make a low. The river was the making a flush and the low for Ahmed and his supporters erupted in celebration. Michael Mizrachi came incredibly close to winning his second bracelet today, dominating proceedings all the way up until a very swingy heads up match that really could've gone either way. 'The Grinder' will have to wait until another event before he takes another shot at bracelet number two. Michael Mizrachi has been knocked down to shrapnel. Mizrachi check-called a bet on a flop before leading on the turn, Owais Ahmed raised this bet and fired on the river after the 'Grinder' had checked. Mizrachi called but couldn't beat Ahmed's for trip fives. Michael Mizrachi called a raise out of the big blind and then proceeded to check calls bets on all streets of a board. However, Owais Ahmed turned over for aces up and took the pot. Joining the action on fourth and Mizrachi bet fourth and fifth before Ahmed bet his open kings on sixth and then fired another bet on seventh. 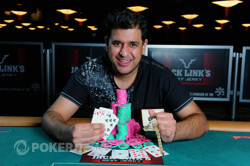 Mizrachi made the call but had to mucked when Ahmed showed for kings and queens to regain the chip lead. It's now the last level of the day of the day. Unless we have a winner in the next hour, we'll be coming back in about 12 hours time to finish this event off. Joining the action on fourth and Mizrachi was betting all the way with Ahmed calling him down before check-calling on sixth. 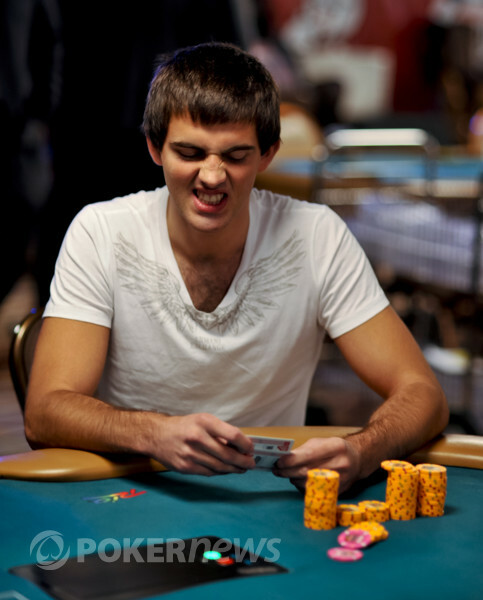 Mizrachi then was check-raised on seventh and sighed, folding a flush face up. Matthew Ashton sees he is in trouble. Eliminated in 10th place.